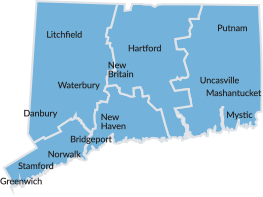 The city meets the country in this sophisticated region of Connecticut. From Greenwich to Stamford and New Canaan to Westport, you’ll find high-quality shops, classic antiques and sumptuous dining. Visit the Tony award-winning Westport Country Playhouse. Take the kids to Connecticut’s Beardsley Zoo in Bridgeport or the Maritime Aquarium in Norwalk. National Park Service site. Served as the home and workplace of prominent American artists Julian Alden Weir, Mahonri Young, and Sperry Andrews. More than a dozen changing exhibitions in art and science annually, live animal marine tank, lectures, educational workshops, museum store.